220 martial artists and supporters turned out at the AKBBA 50th-year celebration banquet at the Hotel Intercontinental in Dallas on September 19. They witnessed karate demonstrations, high-dan rank promotions (Angela Bastiste to 5th, Rodney Greene and Rick Faulkner to 7th), and the Texas Blood and Guts Hall of Fame awards. 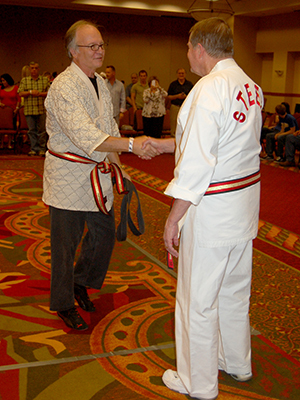 Our founder, Allen Steen, seemed moved by the heart-felt accolades from some of his original black belts. Earlier in the day, almost a hundred students benefited from seminars by world-renown masters and grandmasters including Dan Anderson, Rick Moneymaker, Roy Kurban, Keith Yates, Roger Greene, John Liles, Steve Doss, Steve Selby and George Clarke. Go to www.roark-photography.com to see and order photos from this special event. There are a very limited number of “Photo History Books” covering the first fifty years of not just the AKBBA but of Texas Karate. You may find yourself in these pages. Just ten dollars plus shipping and handling. Go to the catalog page to order yours before we run out. 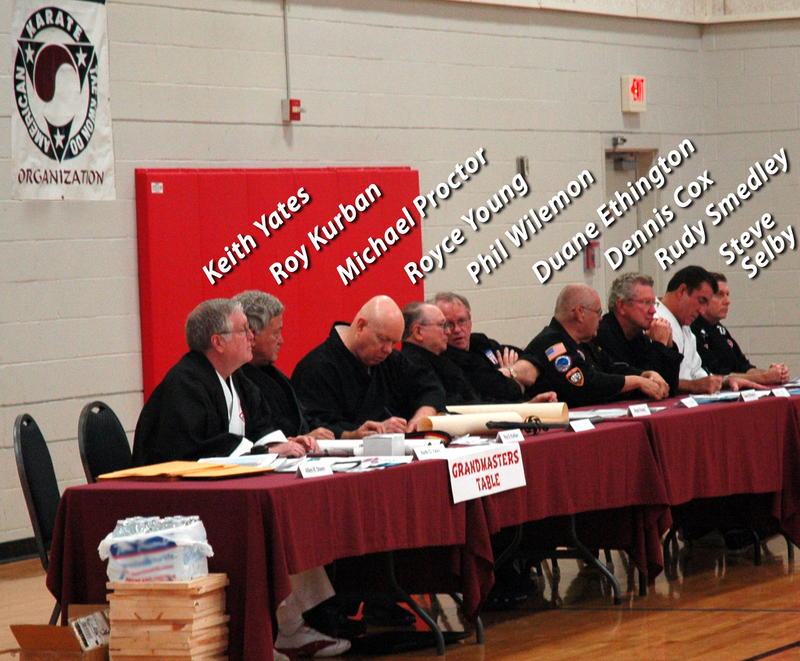 Chairman Keith D. Yates and several other board members promoted five high black belt ranks to candidates testing on December 13, 2014. Aaron Barnett, Ceaser Johnson and Tim Looney received their fifth dan rankings. Caroline Goodspeed was promoted to seventh dan and Kelly Cox received his eighth dan black belt. A very special promotion was made as Mr. Duane Ethington received his tenth degree black belt certificate. Grandmaster Ethington has been in the martial arts for almost five decades and he still teaches weekly at the age of 77. He has demonstrated true warrior spirit over his career and his many students will carry on his legacy. Congratulations to all these outstanding martial artists. The Masters Hall of Fame was held in Ft. Worth, Texas on June 6th and many AKBBA/CSHK board members and instructor members were inducted. No other martial arts organization had so many members represented. Jamie Cashion (an AKBBA/CSHK member himself) organized and hosted the record setting event. See if you can pick out the AKBBA/CSHK folks above (photo caption in the New Photos Gallery). On February 8, AKBBA/CSHK Chairman Emeritus was honored with an induction into the Masters Hall of Fame. Over a hundred and fifty people came to acknowledge this martial arts legend and to thank him for the decades of service he has given to not just the AKBBA/CSHK but to the martial arts community across the nation. Thank you Grandmaster Toney. We appreciate you. We are saddened to note that Grandmaster Philip Ola, High-Dan Board Member Elect, passed away on December 11, 2013. 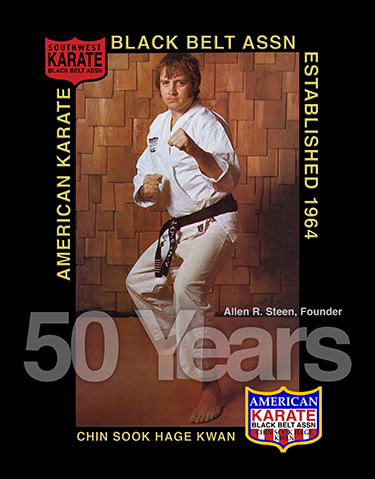 Mr. Ola was one of the original black belts in Allen Steen’s Texas Karate Institute in the 1960s and went on to teach not only for Mr. Steen but also for Jhoon Rhee in Washington D.C. He trained in other styles and earned dan rank in several other martial arts. The AKBBA and Mr. Steen awarded him a 10th Dan in the summer of 2013. He served in D.C. as a legislative aid to the House of Representatives and as a lobbyist for the steel industry. He earned an MBA from Loyola University and later returned to his native Texas and opened a real estate business in Arlington, TX. The martial arts community is richer because of the influence of Phil Ola. We are pleased to announce the addition of four pioneers of the martial arts in Texas (and beyond) to the AKBBACSHK High Dan Board. Philip Ola was one of Allen Steen’s original black belts of the early 1960s. He has gone on to train in and earn dan ranking in several other arts. He holds an AKBBA 10th Dan. 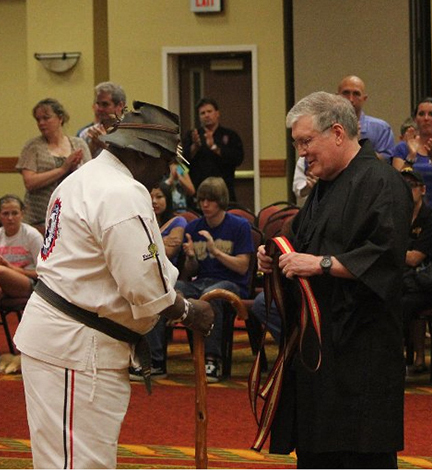 Jose Santamaria was one of the earliest black belts in MuDukKwan and Taekwondo in Texas. He has operated schools across the state and was promoted to 10th Dan last summer in recognition of his achievements. 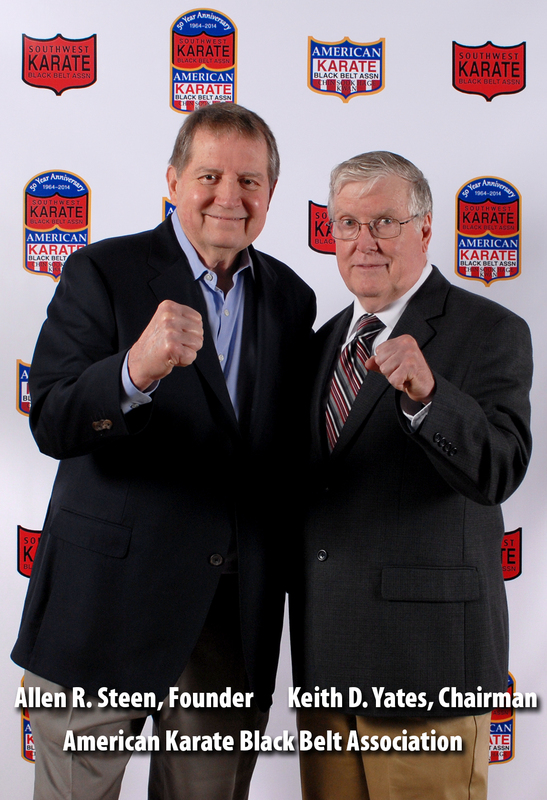 Phil Wilemon was a champion fighter in the 1960s and is also considered a pioneer of Texas Karate. 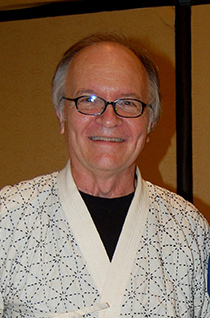 Dennis Cox was another of the earliest black belts produced by Allen Steen’s TKI schools and is a popular seminar instructor. These outstanding individuals, along with the rest of the HighDan Board, are committed to buldling on the dynamic legacy of the AKBBACSHK. Phil Ola is congratulated by Allen Steen. Joe Alvarado puts on his 10th dan ceremonial belt after a presentation from Roy Kuban. Thehighest rank in karate, the tenth degree black belt, is understandably rare. So it is a historic event indeed when four individuals are promoted to his level. Jose Santamaria, Philip Ola, Fred Simon and Joe Alvarado received this honor on June 14th at the AKBBA ceremony in Mesquite, Texas. 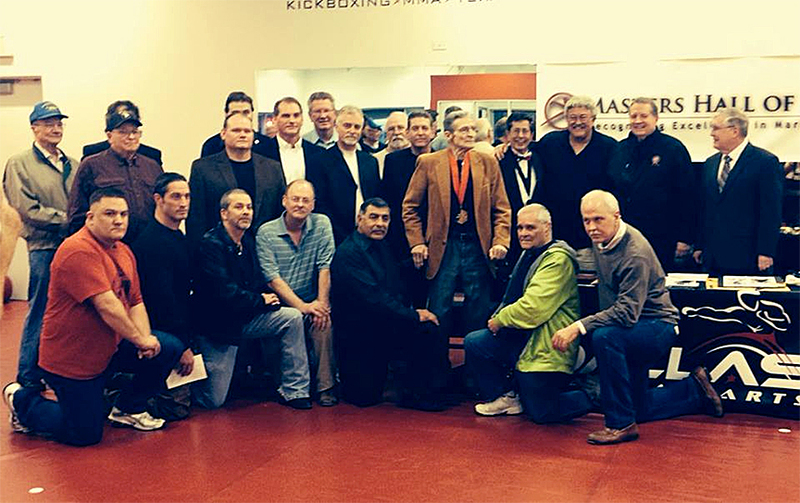 All are Texas legends having trained and received their black belts during the “blood and guts” 1960s. GM Santamaria has taught in Killen, Austin and Dallas and was one of the early promoters of karate competitions. Phil Ola, earned his black belt from Allen Steen at the Texas Karate Institute and went on to teach for many years with Jhoon Rhee in Washington D.C. Mr. Simon was GM Rhee’s first African American black belt. Joe Alvarado was a pioneer of karate in the Austin area and has trained law enforcement personnel for years. Congratulations to these highly skilled martial artists. IF YOU WANT TO BE CONSIDERED FOR NEXT YEARS PROMOTIONS you must be a member of the AKBBA for at least a year before you can be considered. Go to the APPLY tab above to apply for membership. AKBBA/CSHK High-Dan Board Chairman graces the cover of the new Official Karate Magazine 2013 Annual. You’ll want to read this article about one of the pioneers of the martial arts not only in Texas, but in the nation. We are proud that GM Yates has received this recognition. You can view the issue at www.officialkaratemag.com or you can purchase a copy at the upcoming AKBBA/CSHK promotional ceremonies on June 14. Maybe you can get him to even sign it for you! The High Dan Board recently voted to simplify the membership requirements. There will be two main levels of AKBBA/CSHK memberships: Student and Black Belt. Students will only be able to join under the auspices of a Black Belt. In addition we have an Affiliate Instructor Membership which is open to candidates who hold a third dan or higher and who own or are head instructor at a martial arts school. Click on over to the “Apply” tab at the top of this page for more information. We are making membership in this historic association even easier. Below: Steve Selby, Richard Jenkins, Dan Anderson, Keith Yates. Mr Anderson with Ishmael Robles, and with Linda Denley. 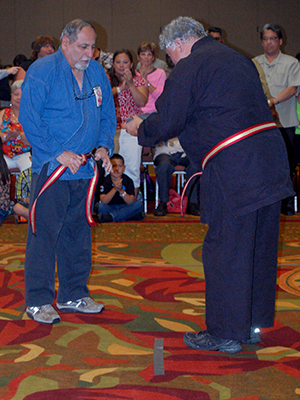 Dan Anderson was promoted to 9th Degree Black Belt before of panel of several AKBBA High-Dan Board Members in Houston in October of 2012. Grandmaster Anderson is on everyone’s list of the most successful karate fighters ever. He won over 70 championships in his competitive career. He was one of the very first to call his system “American Freestyle Karate,” authoring a book by that name in the early 1970s. He is also a master of modern Arnis. He teaches at his own school in Oregon.